Police line the dirt roads of this village in Egypt’s deep south whose dispute over a Christian place of worship has spread nationwide and plunged the ruling army into its deepest crisis since Hosni Mubarak was ousted. A Coptic Christian woman who called to a visiting reporter from a balcony in Marinab, a settlement of hundreds of Christians and thousands of Muslims, said the Muslim villagers had effectively imprisoned her. Although there were no physical barriers to her home, police tried to stop visitors going in and the family stayed huddled fearfully inside, Reuters reports. “Our children haven’t gone to school in 15 days! We are trapped!” the woman yelled, before her husband quieted her for fear of the neighbours. The trouble began when Christians in the village in the summer started building a dome on a half-finished building used as a place of worship for decades. Details of what happened next are hazy: the Copts say some Muslim residents tried to tear the new structure down, arguing it did not have proper licensing, but the Muslims say there was a fire which they tried to put out. Tensions in the village quickly spread and this week boiled over onto the streets of Cairo, 700 km (440 miles) north of Aswan city, Marinab’s nearest big town, leaving 25 dead as Coptic protesters clashed with military police. Rows over places of worship have long been at the heart of complaints by Christians in Egypt, who make up 10 percent of the population. But a spate of such attacks since the uprising that deposed Mubarak in February has upset Copts who say the country’s interim army rulers have ignored their grievances and failed to protect them. The rise in attacks on churches this year has been particularly blamed on Salafists and other strict Muslims who have emerged after the toppling of Mubarak, who repressed Islamists. “This is not the Islam we grew up with,” a Christian villager named Morkos shouted at a visiting reporter as his brother tried to calm him down. “We know Islam, we live among it, it never meant tearing down our churches,” he said. Politicians of all shades have met and criticised the violence, saying the army has lost the people’s trust. The finance minister tendered his resignation in protest at the handling of the clashes, although it was rejected. “We are all family. All these problems started because of the church. They (Muslims) seem to think we don’t deserve it,” said Ashraf Ayad Gerges, a Christian overlooking the site of the ruined building where red bricks were piled up. Blackened wooden planks pierced through the rubble. Inside one Coptic home, Christians spoke in low voices about their grievances, telling each other to whisper lest “they” — the police who were trying to listen in — heard. On the rooftop of the simple four-storey house, they displayed the empty bottles they said were being stored in case they needed to make petrol bombs for defence. Muslim villagers say they don’t understand their fears and add there have never been any attacks on Copts in the village. The Marinab row seemed to follow a typical pattern, where conservative Islam may play a role but where the core issue is more about a traditional tug-of-war in poverty-ridden rural Egypt between families and tribes. Each side gives a competing account of what happened in this case, but both admit that village elders had agreed to a compromise on the church building that the Christians were slow to follow. Muslim villagers deny they have any objection to the presence of churches and are swift to point out two others in the village. But they say any new house of worship must be licensed. Christians say the building did have the right papers. “The people of Marinab have nothing against building a church at all,” Mohamed Moussa Sadeq, a village cleric, said, sitting around in a traditional rural home with dozens of village elders and religious leaders. “We live with them, we love them. What happened in those clashes in Cairo is not from us. Don’t use us to light your flames,” he said. The Muslim villagers’ position was endorsed by Aswan province governor, Mostafa al-Sayed, who says there were procedural errors in the licence for the building, a claim the church and its lawyer refute. Sayed’s position was proof of official bias for Christians, who wanted him sacked and protested for days before the clashes in Cairo erupted. The governor was not taking calls to comment. Residents in the province say the government’s passive attitude in the face of previous church attacks has sent a message that such violence is acceptable. “If the church is wrong, those upholding the law should be the ones holding it to account, not the people themselves attacking it,” Father Daoud Halim El-Gad of the Archangel Mikhael’s Coptic Cathedral said from the city of Aswan. Church construction licences in Egypt are more difficult to obtain than approval for mosques, rights groups say, a constant source of aggravation for Christians. Rights groups and Christians have long called on the state to issue a law that would unify regulations. But Christians say the government’s promise in March, after one church was torched, that it would work to implement new rules had not materialised. 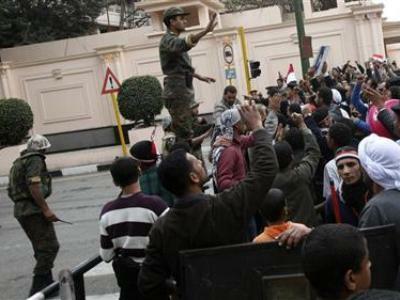 After Sunday’s clashes in Cairo, the government said a committee would speed up drafting of the law. “There is a loud voice that prevents the issuing of any law. Whose voice that is, I don’t know,” Father Daoud said. “I swear to you by the God almighty, there has never been strife in this town, tension perhaps, but we are humans and are bound to have differences,” said elder, 73-year-old Hajj Ali. Others told a different story. “Every time a window is opened, they throw rocks at us. I can’t leave the house, if I go out I’ll be killed,” one Copt said from his home, although he was later seen strolling outside and smoking a cigarette with a Muslim shopkeeper around the corner. Ibrahim Al-Barsy, the coordinator of a group called the Arab tribe coalition in Aswan, tried to divert what he saw as an unwelcome spotlight that has now been shone on the area. “In Aswan, we don’t have problems we don’t solve ourselves. This is the custom. This is what we learned from our forefathers. Our creed is compromise,” he said. “This is the government’s fault with its paperwork. We have no problem in our hearts towards Christians,” he added. Authorities in the local province say the root of the problems goes far beyond them. “Our people are simple and kind. It is going to take time and before we heal a wound, we have to clean it first. They deal with problems and not the reasons for them,” said one official in the province who did not want to be named, referring to authorities in Cairo.